Oscillating Sprinkler Tips. Is It Broken? Keep It Turning! Is It Broken? Keep It Turning! 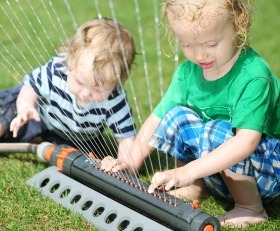 Is an Oscillating Sprinkler the best portable sprinkler for lawn and garden watering? Not absolutely, but I favor it for most applications. Yet many gardeners complain that these sprinklers are unreliable and bothersome. Regardless of the brand or the price, they quit oscillating soon or sooner. Is that true? Sadly, the negative reviews on this product suggest that frustration with oscillators is unavoidable. In addition to performance issues, some of them are difficult to adjust to the pattern needed. 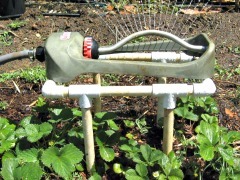 But this method of irrigation is so beneficial that every gardener needs one. Would you like a few tips to keep this gentle watering device on your “Must-Have” List? My disappointment level with oscillators has been quite high, yet I kept buying new versions, hoping that some manufacturer would discover or create the perfect mechanism. I learned a few things through my process of trial & error that may help you get longer life and more efficient watering from most oscillators. This article will address the use and care of oscillating sprinklers so you do not accentuate any inherent design flaws. A follow-up article will evaluate different models with performance reviews, plus tips for adjusting them. What's The Problem With Oscillating Sprinklers? Moving parts within these sprinklers are problematic. In any mechanical gizmo, moving parts will break, get stuck or fail to remain in proper alignment. Oscillating sprinklers look to be a rather simple device on the outside, but must be quite vulnerable inside. Are they? Read the reviews on ANY model and they ALL seem doomed to failure. How do we explain Five Star and One Star Ratings on the same unit? Is that lousy craftsmanship by the manufacturer? Cheap materials? Bad design? Getting the best service and the most life from these irrigation tools is partially a factor of buying a quality model with appropriate features, but also requires a bit of smart thinking on our part. Only if we are giving a device the best chance to perform can we realistically evaluate one model against another. So let’s learn a few tricks. Oscillators dispense the water through a row of nozzles or jets spread evenly along a hollow tube. These jets are capable of shooting streams of water a great distance, which enables this sprinkler type to cover very large surface areas. The water is distributed in a single fan-shaped line that constantly moves back and forth across the lawn. …unless the sprinkler gets stuck! It’s natural to assume that the problem is internal when that happens. But let’s consider several factors that can affect performance on some models. Keep in mind as we go through this list, each model may vary, and so should your expectations. Just replacing an oscillating sprinkler that you liked, with the same model, may not give you the same performance. Things change, materials get substituted, even your water pressure fluctuates. So be observant, evaluate thoroughly, and be smart to take the correct action as your situation warrants. If you notice anything that I overlooked, please contact me to share it! Some of these may be obvious difficulties that people could decipher on their own. But I like to cover all the basics for those new to a gardening environment. And some problems may be disregarded by the skeptical, but trust me, these are all common issues with oscillators. If the water level is too low, the distribution bar on an oscillating sprinkler may be unable to move at all, or it may move very slowly to the end of the cycle, then be unable to move past the pivot that sends it back in the opposite direction. (This varies a lot between models. One oscillator may function fine with the water stream only 18” high, yet another gets stuck unless the water flows above 36” high. If the water is too strong, it may force the gears to operate outside their design specifications. They may rub against each other or the body housing, or move out of alignment, causing the bar to move erratically or not at all. Some situations may have abnormally high water pressure which can only be reduced by installing a pressure regulator. Most domestic supplies have household regulators, normally set at 50-60 PSI, which should work fine. Anything higher will need corrective measures. Any thing that has contact with the rotating bar or cylinder, or with the adjusting mechanism, is going to cause friction or outright interference. The gear assembly will not function well, maybe not at all, when it encounters an extra load from just a bit of external rubbing. Depending on the quality of parts and the design, it may just freeze temporarily, or may try to force itself to the point of stripping the gears or dislocating their positions. Take Note: An oscillating sprinkler sits with a very low profile, in almost all models. The newer designs with extra adjustment options have a fat cylinder that is especially prone to rubbing against tall grass or weeds or thick mulch. Once I made that initial observation, I was amazed at how easily the sprinkler succumbed to interference just by placing it down on anything other than a compact, level surface. 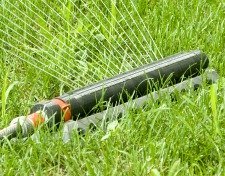 When the sprinkler sank down in dense grass or was on bulky ground cover or uneven mulch, it did not rotate. When picked up, it immediately continued its rotation. Set a flat board or a couple of sticks under the frame of the sprinkler to raise it up and ensure proper clearance. We’ve all done it. Grab the nozzle bar and spin it ahead to get it where we want so we can push the adjustment ring to the right place. Every time you reject this advice, remind yourself that the shortcut is costing you money. How many times do you get to be a Bully, before the gears give up? Be Patient. Move only the adjusting levers. Don’t try to force the nozzle bar of an oscillating sprinkler when you need to change the pattern of rotation. Allow water flow to move the sprinkler bar to the correct position without rotating the cylinder or bar by hand to get it there. 1. Just hold the sprinkler up-side down (and away from you!) as it rotates, then make the adjustment as it passes the boundary for the pattern you want. 2. Use a board or bucket to hold above one-half of the water jets to keep from being sprayed. The jets shooting away from you will display the position. Adjust as the new edge boundary arrives, and let it cycle a couple of times to fine tune the oscillator. TIP: When you turn off the sprinkler, wait for the spray to come back to a near vertical position, instead of out to the side. Now it is ready for a general adjustment when you use it next in a different area and find that you only want a half or reduced cycle. You won’t be tempted to wrench the bar around to get it started right. But no matter how much we want or expect it to perform in an “altered state”, it is not happy. I suspect that the problem again is having such low tolerance on the gear specifications. A minor tilt should be ok, but more than 15-20 degrees off vertical is pushing it. Make a framework that matches the degree of slope, on which the sprinkler can sit level, if you constantly will be watering a sloping area. Try using PVC fittings & pipe to make a square with legs on just one side. Or place a fat block under one side and a thin block under the other side. An alternate approach for hillside watering: set the oscillator only at the top and bottom of the slope, on level ground, and set the pattern accordingly to get the proper coverage. Would a family summer be complete, without kids running through the sprinkler? Have a blast! Just do it with a cheapo unit, instead of your temperamental oscillating sprinkler. Who can blame them for wanting to explore a moving device, especially with water coming out! Why take a chance on premature disability for your vital lawn irrigation tool? If the sprinkler itself is prone to damage by its own nature, why take a chance? Get an inexpensive plastic watering ring at a local discounter for a few bucks. The negative side of those is the high water flow they dispense. They can make an area of lawn soggy in a short time, leading to compaction from all the jumping and sliding. The old-fashioned rotating arm sprinkler is a good alternative. It sprays 3 or 4 streams of water in a swirling fashion that elicits whoops of delight, and is a low-flow unit. Also very durable, the kids can stop the spinning arms and even try to dis-arm it, without hurting it or your wallet. Available low & high priced, get a cheap one for play. Keep Nozzles Unclogged. Poke with a small paper clip any jets that show a weak or erratic stream. Some models hide a poker in the end plug. Poke from the inlet side to the outlet, followed by opening the plug to flush any debris. Check Soil Saturation To Determine How Long To Water. Unlike other common type sprinklers, portable or in-ground, an oscillating sprinkler (and rotors) must run longer to provide sufficient irrigation. This is NOT wasting water because you are covering more area but not all at once, as the water stream moves along. Take Advantage of Adjustment Options. Adjustment mechanisms can be difficult to interpret. Don't feel stupid and settle for a compromise method of watering. Mess with it until you understand how to change the pattern from left to right to center to full. Call the manufacturer if you need to. Some oscillating sprinkler models offer side-to-side adjustment in addition to length of pattern. to confine the spray pattern or spread it out wider, while keeping the length of throw at the distance you need. 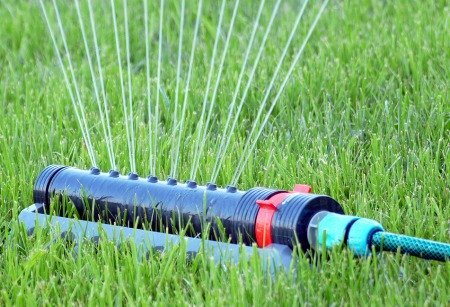 An Oscillating Sprinkler is a very efficient irrigation device. By constantly moving the water across the lawn or garden area, you allow the soil to soak it in completely and avoid run-off. The moving parts and necessary adjustments required to produce this effect make the sprinkler susceptible to damage from without and within. Oscillators have a wide price range, from $10 to $60 or more. Higher expense doesn't guarantee more satisfaction. 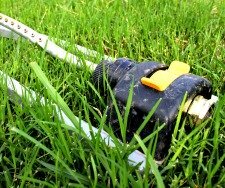 Gardeners can get the full value from this investment by treating the sprinkler as a tool and taking care as they handle it, and watching where they place it. Avoid frustration by taking the time to get familiar with adjustment options. Prevent breakage by avoiding common practices that compromise the vulnerable traits of this moving sprinkler. Contact the Garden Counselor with your comments about particular models, both good and bad. We'll compile a resource page to enlighten other gardeners and improve the gardening experience for all of us!